The hibernation ends (yet again)... Yes, just 1 post in the past 6 months!!! Well, I didn't have much to write about recently, other than the fact that I have been on the move since May. But, now that I am settled at one place for quite some time, I thought of picking up this whatever little habit of blogging I had earlier. Sitting at home after an usual day at work wasn't that common when I was in India - I generally came back home late. Here, its different. Its almost winters now - yes, I mean "almost", as most of my informants have warned me about how harsh winters are usually here. With DST off, things get dark a bit too early. 5 0clock, and its dark outside. And not to mention the constant roar of the wind which I am able to hear outside my apartment window. I remember, when I landed in Chicago on 15th August, I loved the weather here. It was warm and sunny, and I could see the daylight till late 8.30s. And I made full use of that opportunity to visit some of the most famous places in Chicago - the Field Museum, the Shedd Aquarium, the Adler Planterium, the Science and Industry Museum to name a few. 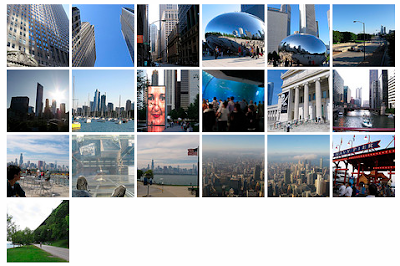 Millennium Park and Lake Michigan are just a mile walk from where I stay, so I used to visit those places frequently. And there was the Chicago Jazz Festival which 1 of my friends dragged me to. One thing I like about this place is how much information is accessible anytime you want. My earliest friend in Chicago was in fact - google maps. From locating the nearest Walmart store, to exploring the various bus and train routes of CTA, it was really the most useful tool I found during my initial days here. Now, that the winter sets in, it is getting difficult to get out of the house. But I am enjoying the cold chill - reminds me of the times I spent in north India. Well, thats a lot of updates I seem to have given. But that pretty much sums up what I have been doing these days. Why don't you write something on your blog about how scared you were to post a comment here :P ?? Awesome post.. After a long time indeed..